Dr. Mitchell is a Radiologist, Department of Radiology, Advocate Christ Medical Center, Oak Lawn, IL. At the time this article was submitted for publication, she was an Associate Professor in the Department of Radiology at the University of Chicago, Chicago, IL. Bariatric surgical procedures typically consist of a restrictive component with or without a malabsorptive component to achieve weight loss. There are 3 bariatric surgical procedures in common use today: Roux-en-Y gastric bypass (RYGB) surgery, duodenal switch (DS) with pancreaticobiliary diversion surgery, and laparoscopic adjustable gastric banding (LAGB). Radiologic assessment of these procedures is often done in the immediate postoperative period to conﬁrm that the postsurgical anatomy is intact. In addition, imaging is frequently requested by the surgeon when complications are suspected. A good understanding of the postsurgical anatomy and of the appearance of complications is essential for accurate interpretation of these studies. Standard technical settings and protocols are usually inadequate for imaging the morbidly obese patient. For ﬂuoroscopic examinations, we use only digital imaging, as analog systems do not penetrate the patients’ bodies sufﬁciently. Water-soluble contrast medium is preferable for a few reasons. It is sufﬁciently opaque to provide diagnostic information, but is sufﬁciently lucent to avoid inadequate beam penetration in these large patients. Most clinical questions concern the proximal anatomy, so dilutional effects are not an issue. In addition, the more common postoperative complications include anastomotic leak with extravasation into the peritoneal cavity. If the main concern is for signiﬁcant obstruction without leak, low-density barium can be used. 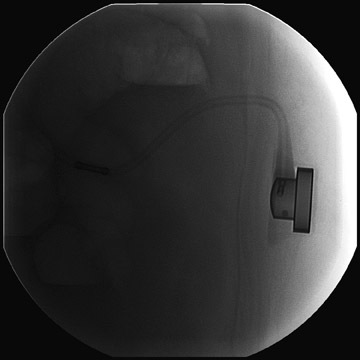 Contrast is administered orally in small increments or in patient-controlled swallows during ﬂuoroscopic observation. A total of 100 mL of oral contrast is usually adequate. 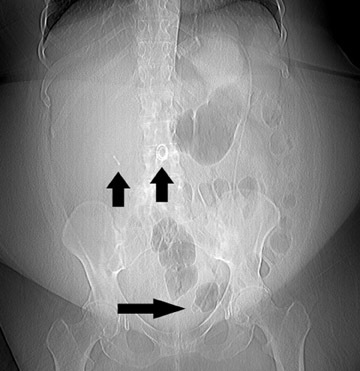 Ideally, the patient should be imaged supine and upright and assessed in frontal, lateral, and oblique projections; however, the reality is that many of these patients are too large for any imaging other than in a standing anteroposterior projection. 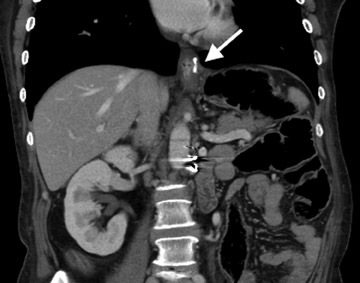 Computed tomography (CT) examinations also require technical modiﬁcations to penetrate these patients. The kVp should be increased to 140, and mAs should be increased to 300 to 400 with manual settings. The scan protocol should use oral and intravenous (IV) contrast as indicated by the clinical question. Increasing the dose of IV contrast by 10% to 20% may improve contrast enhancement. Laparoscopic RYGB was ﬁrst reported in 1994 by Wittgrove et al.6 The procedure involved the creation of a small gastric pouch with a volume of 20 mL, which is isolated from the remainder of the stomach. This is the restrictive component of the procedure and is the main factor in weight loss. 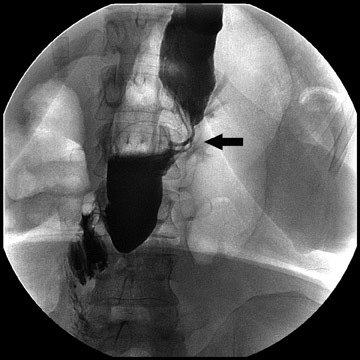 The jejunum is divided 10 to 15 cm distal to the ligament of Treitz, and a 100-cm Roux-en-Y is created that is brought up through the transverse mesocolon and anastomosed to the gastric pouch. This alimentary limb is the malabsorptive component of the procedure and is a secondary contributor to weight loss (Figure 1). 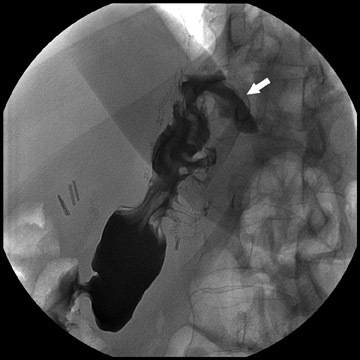 During ﬂuoroscopy, contrast should pass easily from the esophagus into a small gastric pouch approximately 3 to 4 cm in diameter and should then ﬂow easily into the Roux limb. The Roux limb will have a jejunal mucosal fold pattern and will descend in the left abdomen (Figure 2). 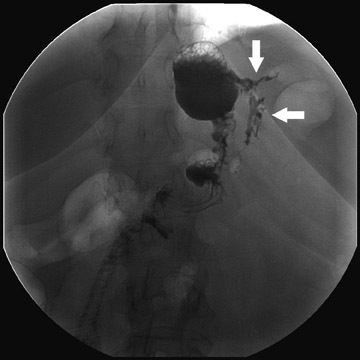 If the anastomosis between the gastric pouch is end-to-side, a small blind stump of bowel will be seen that should not be confused with an anastomotic leak. The length of the remaining small bowel is only slightly less than in normal patients. Complications that are diagnosed radiographically have been estimated to occur in 10% of patients. 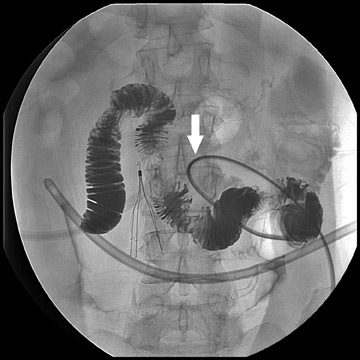 The most common complications encountered with RYGB are anastomotic leaks and anastomotic stenoses, both of which more commonly involve the proximal anastomosis.7 A leak is diagnosed by the identiﬁcation of contrast extravasation at the anastomosis. 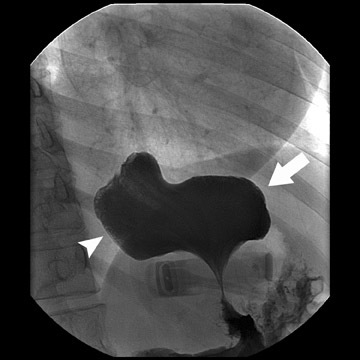 The leak will be intraperitoneal if the pouch was separated from the remainder of the stomach (Figure 3). 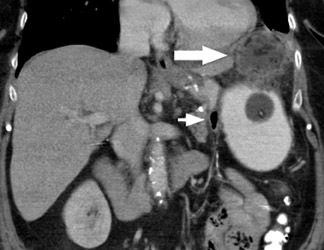 If the stomach was not transected at the suture line, a leak may occur along the staple line and will opacify the excluded stomach (Figure 4). A stenosis appears as a narrowing of the anastomosis. In the immediate postoperative period, these stenoses are usually caused by edema and are self-limiting. A stenosis in the later postoperative period is more likely to be caused by ﬁbrotic strictures (Figures 4 and 5). 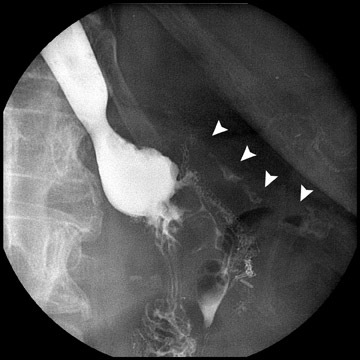 Atypical complications of RYGB are much less frequent.8 Anastomotic leaks may resolve with conservative management; however, they may occasionally progress to abscess formation or to the more rare complication of enterocutaneous ﬁstula (Figure 6). 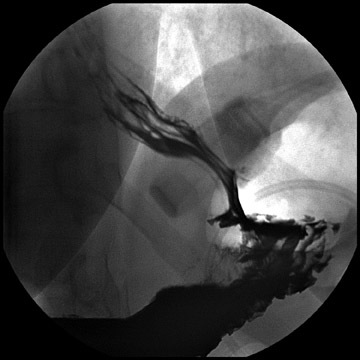 Hernias are another uncommon complication of RYGB and present with obstructive symptoms. 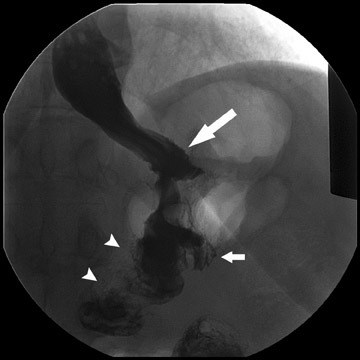 These can be internal hernias, particularly through the mesocolic defect created during the surgery (Figure 7), and ventral hernias, often through the incision sites. Misconstructions are rare complications that are typically seen after surgical revisions, rather than after the primary surgery. An antiperistaltic Roux limb inversion occurs when the Roux limb is cut at both ends and is inadvertently re-anastomosed in an inverted fashion. 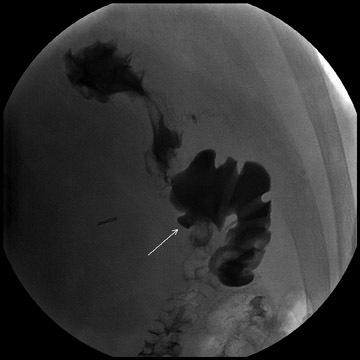 This results in retrograde peristalsis, and patients will present with nausea, vomiting, and/or intolerance of food. 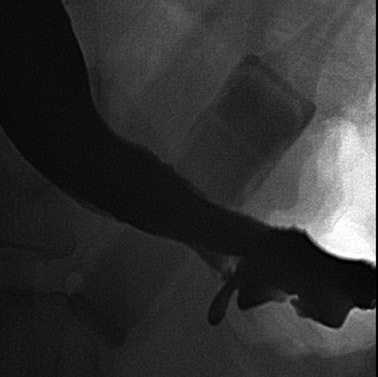 The anatomy will look normal on static images, but the Roux limb will show reversed peristaltic activity during ﬂuoroscopic observation when challenged with an adequate volume of contrast. 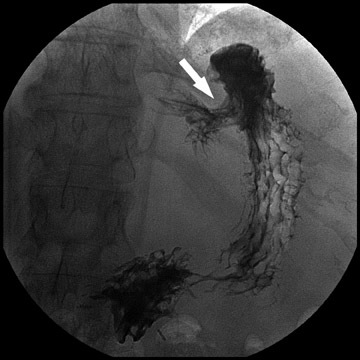 Another rare misconstruction is the “Roux-en-O,” in which the biliary limb is inadvertently anastomosed to the gastric pouch, again resulting in an antiperistaltic Roux limb conﬁguration. This diagnosis should be considered in patients who present with bilious vomiting and chronic malnutrition. Ulcers are another rare complication that are usually not identiﬁable radiographically (Figure 8). 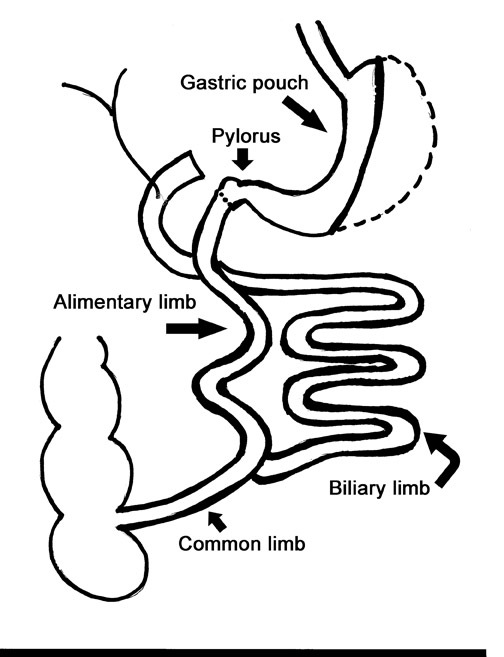 The gastric pouch following DS is larger than that in RYGB (Figure 10). It is tubular and runs the length of the lesser curvature. The pylorus is identiﬁable in the epigastrium or the right upper quadrant and results in intermittent emptying of the stomach. The alimentary limb will have an ileal fold pattern and descends into the right abdomen. A Baker’s pouch may be present. The length of the remaining small bowel that will be opaciﬁed is much shorter than with RYGB. Complications that can be diagnosed radiographically occur in approximately 20% to 25% of patients. This is a higher incidence than with RYGB. 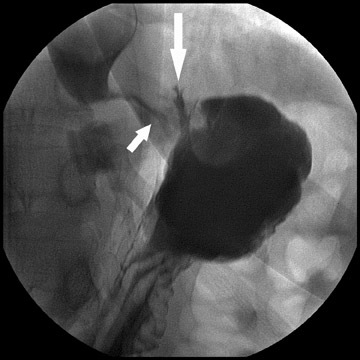 The most common complication following DS is bowel obstruction, the majority of such cases are caused by anastomotic stenosis at the gastroenteric anastomosis or in the gastric body. As with RYGB, these are commonly due to edema in the immediate postoperative period. They can be due to ﬁbrosis or adhesions when they occur later and may involve the gastric body as well as the anastomosis (Figure 11). Anastomotic and suture line leaks are less common than with RYGB, but they still occur and can develop into abscesses (Figure 12). Hernias are also relatively common complications and tend to be ventral more often than internal. 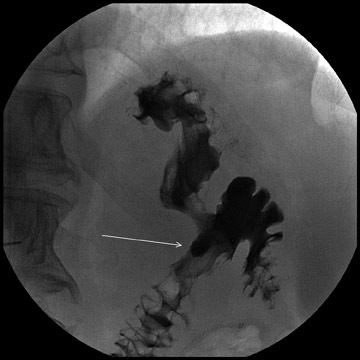 Symptomatic hiatal hernias are rare but can occur due to the acidity of the gastroesophageal (GE) reﬂux in patients with DS surgery (Figure 13). Hiatal hernias with RYGB are usually of little consequence, because the gastric pouch lacks parietal cells. Other rare complications include ulcers and enterocutaneous ﬁstulae. 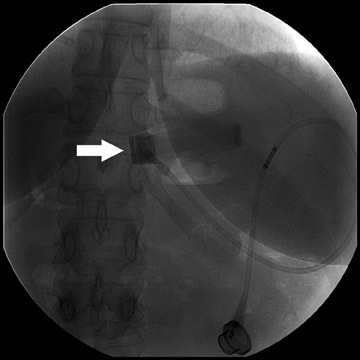 The gastric band is radiopaque and lies approximately 2 to 3 cm caudal to the GE junction; its proximity to the GE junction varies with the surgeon’s preference (Figure 14). It should form a 45˚to 55˚angle with the spine. 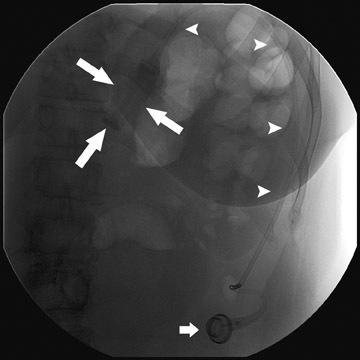 Connecting tubing will extend from the pouch to a subcutaneous port placed in either the left anterior or the left lateral abdominal wall. Upon upper gastrointestinal examination, the gastric “stoma” at the level of the pouch is typically between 5 and 10 mm (Figure 15). This diameter can be varied by inﬂating or deﬂating the band with saline. The optimal diameter is determined by the patient’s tolerance and rate of weight loss. Several complications of LAGB have been described.13 Band misplacement or displacement can be too high and on the esophagus, in which case the reservoir function of a gastric pouch is lost and the patient never has a feeling of satiety; or it can be too low on the stomach, which results in pouch dilatation (Figure 16). The stoma can be too tight, resulting in pouch dilatation (Figure 17); or too loose, resulting in failure to lose weight. 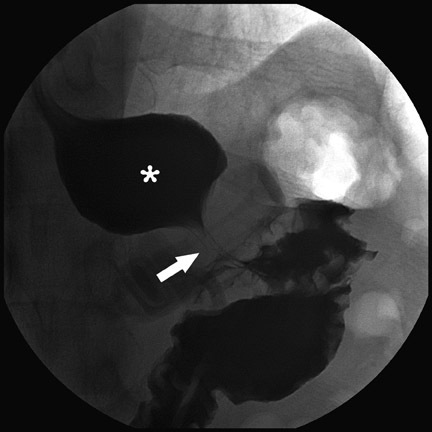 A less common cause of pouch dilatation is gastric stricture at the level of the band. Tubing disconnection can occur and usually requires surgical correction (Figure 18). The access port can rotate and invert within the abdominal wall, which also may require surgical correction. 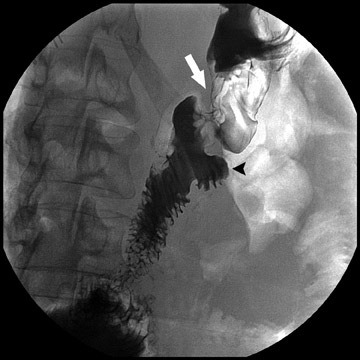 Paragastric herniation of the gastric cardia alongside the stomal segment is a rare complication (Figure 19) that may be caused by a band position anomaly. This has not yet been reported in the literature. Bariatric surgery is becoming increasingly popular for weight loss in morbidly obese patients. A variety of procedures may be used. 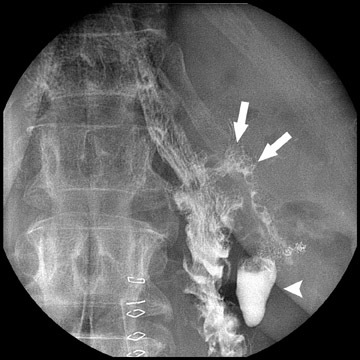 For proper interpretation of imaging ﬁndings, it is essential that radiologists know postsurgical anatomy prior to examination of these patients. Functional abnormalities of motility may be occult on static imaging and can be diagnosed only with careful ﬂuoroscopic assessment. Clinical Guidelines on the Identiﬁcation, Evaluation, and Treatment of Overweight and Obesity in Adults: Evidence Report. National Institutes of Health publication no. 98-4083. Bethesda, MD:National Heart, Lung, and Blood Institute;1998. Flegal KM, Carroll MD, Ogden CL, et al. Prevalence and trends in obesity among US adults, 1999-2000. JAMA. 2002;288:1723-1727. National Institutes of Health Consensus Development Conference Panel. Gastrointestinal surgery for severe obesity. Ann Intern Med. 1991;115:956-961. Maggard MA, Shugarman LR, Suttorp M, et al. Meta-analysis: Surgical treatment of obesity. Ann Intern Med. 2005;152:547-559. Buchwald H, Avidor Y, Braunwald E, et al. Bariatric surgery: A systematic review and meta-analysis. JAMA. 2004;292:1724-1737. Wittgrove AC, Clark GW, Tremblay LJ. Laparoscopic gastric bypass Roux-en-Y: Preliminary report of ﬁve cases. Obes Surg. 1994;4:353-357. Carucci LR, Turner MA. 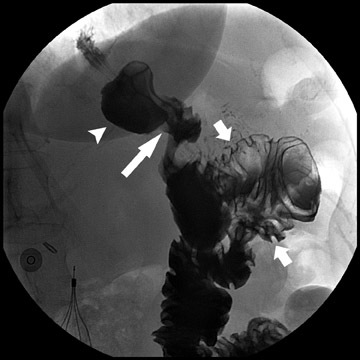 Radiologic evaluation following Roux-en-Y gastric bypass surgery for morbid obesity. Eur J Radiol. 2005;53:353-365. Mitchell MT, Pizzitola VJ, Knuttinen MG, et al. 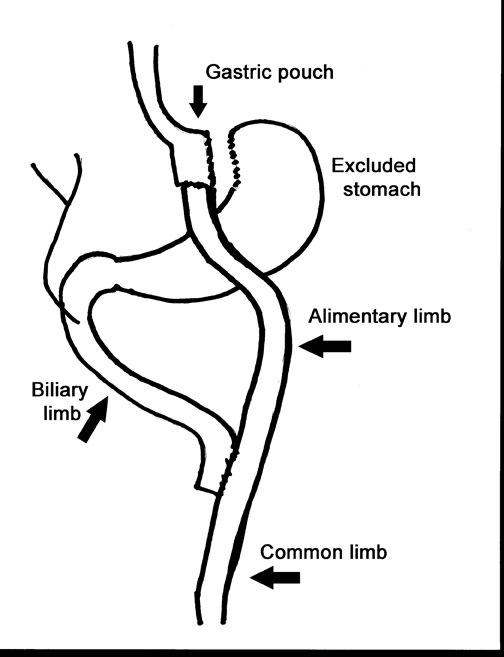 Atypical complications of gastric bypass surgery. Eur J Radiol. 2005;53:366-373. Hess DS, Hess DW. 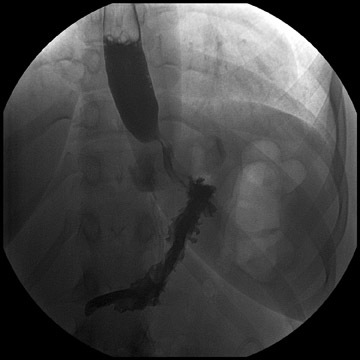 Biliopancreatic diversion with a duodenal switch. Obes Surg. 1998;8:267-282. Marceau P, Hould FS, Simard S, et al. 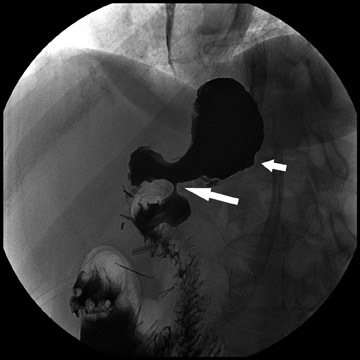 Biliopancreatic diversion with a duodenal switch. World J Surg. 1998;22:947-954. Prachand VN, Davee RT, Alverdy JC. Duodenal switch provides superior weight loss in the super-obese (BMI > or = 50 kg/m2) compared with gastric bypass. Ann Surg. 2006;244:611-619. Forsell P, Hallberg D, Hellers G. Gastric banding for morbid obesity: Initial experience with a new adjustable band. Obes Surg. 1993;3:369-374. Bariatric imaging: Technical aspects and postoperative complications. Appl Radiol.